As sad as it is to say, I can definitely feel autumn creeping in and summer coming to an end. I'm an August baby and so will always have a soft-spot for the summer months - I mean, who doesn't? I actually think we've had a really good summer so far this year and I've spent many a day frolicking in the sunshine, which is basically what I wanted to spend the majority of my summer doing. There have been BBQS, long walks with my dog, day trips away and many a summer evening spent drinking cider and soaking up the last of the day's rays. I've given bike-riding a go (sort of), had picnics in the park and lots of long lunches in the sunshine. 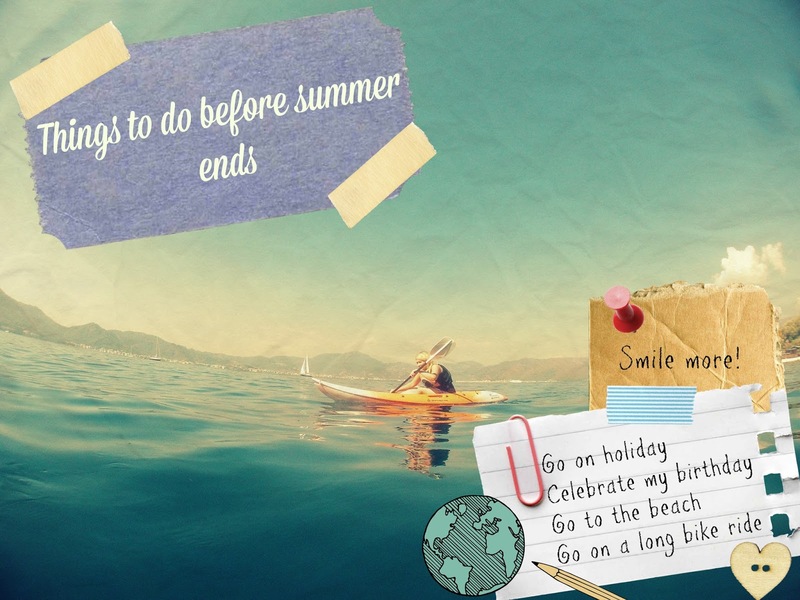 All-in-all, summer has been great - but as it's not over just yet, I thought I'd go through a few of the things I'd like to do before the summer is out. Go on holiday - This one is a biggy and it's about 99% guaranteed not to happen, but a girl can dream, right? I always lust after a late summer holiday, and would ideally love to go to somewhere like one of the Greek islands with my other half. I've never been to Greece before but it looks so picture-perfect I would absolutely love to go. I'm hoping I'll be lucky enough to be whisked away on a blogging trip or something, but alas, that's probably never going to happen. That being the case, I still spend my evenings searching the likes of Thomas Cook for potential last-minute holidays - I know, I'm torturing myself really. Maybe next year? Celebrate my birthday - I'm turning 24 this August and whilst that frightens me profusely, I am excited about the prospect of celebration that birthdays bring. I love it when my whole family come together to celebrate, and I'm hoping the weather will stay sunny for the big day. I'm also slowly but surely putting a wishlist of presents I want together, and there is a lot of makeup on there. I know, as if I need any more!? Take a trip to the beach - I can't actually believe it, but I don't think I've been to the seaside once this summer. Last year I went there multiple times, but this year something or other has got in the way, as well as me feeling guilty for leaving Rory behind (he gets car sick). I definitely think I'm going to have to take a trip to Skegness and soak up the sun, spend all my money in the amusements and buy an ice cream or three. It would be rude not to, right? Go on a long bike ride - As I mentioned previously, this summer was the summer I got back on the bike (literally). I haven't ridden a bike in years and it's definitely been a learning-curve. Whilst I don't think I'm particularly road-safe just yet, I would really like to go exploring on a long bike ride with my boyfriend one day in the coming weeks. Here's hoping this weekend is nice so we can take a trip somewhere. The only downside to going biking with someone is I know I'm pretty much guaranteed to get left behind - oh well! What are your plans for the rest of the summer? Let me know if you take the quiz and what result you get!